How to wipe hard drive data? If you are looking to wipe confidential data from hard drive of your desktop or laptop then you are at the right place. 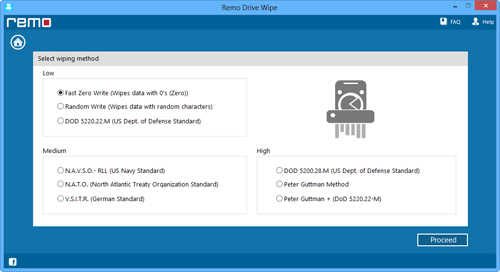 Drive Wipe is an effective utility that uses nine different sanitization standards for permanently shredding deleted or lost files that can mean a lot to you. Your personal and classified data would be completely wiped beyond recovery by any undelete tool in just few minutes. Wiping hard drive becomes an essential task if you are going to sell out your old PC or if simply you give your hard drive to another person. Still if you have deleted all data or if you had even formatted hard drive partitions, there are chances of lost data recovery by using file recovery or undelete utilities. Someone else can recover your important or personal data and he may misuse it. 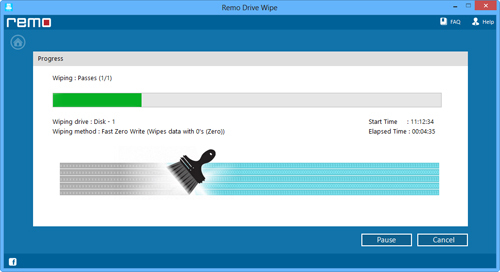 Therefore, to avoid such problems use Drive Wipe software for permanently wiping hard drive. You can make use of this software to erase SanDisk USB drive completely in just a few steps. All these wiping standards are given by various government and defense agencies across the globe for wiping sensitive data from hard drive or from any other storage drive. This software gives you choice of selecting any method based on its wiping strength for shredding or wiping hard drive on your PC. This powerful software will erase hard disk completely without facing any difficulty. It is the best hard drive wipe for Microsoft Windows systems as it works on desktops and laptops having Windows XP, Vista, Win 7, Windows Server 2003 and 2008. Thus, it is single software to all your needs if you prefer to work on Windows OS. Moreover, you will also find it beneficial in wiping flash memory drives and cards. 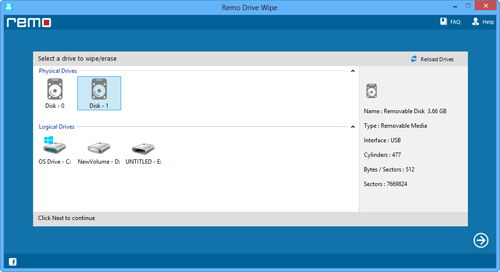 With its easy to use interface, you can perform drive wipe for USB flash drive on your computer. Just download this software and use it to carry out drive wipe for flash memory drive on your Windows PC. You can study the following steps, as they will help you in wiping sensitive data from your PC’s hard drive. Step 1: Download and install DIsk Wipe on your Windows desktop or laptop. After successful installation, double click on desktop shortcut for launching the application. On home page, select the physical or logical drive that you need to wipe and press "Next" as shown in Figure 1. Step 2: From the nine different sanitization standards listed on screen select any one of your choice and press "Next" as shown in Figure 2. You can even go back and select any other drive by clicking on "Back" button. Step 3: Check the wiping process as shown in Figure 3. If you want to pause the wiping process and prefer to continue it later, select "Pause" or if you need to abort the procedure, select "Stop".